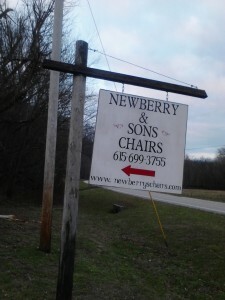 Silver River Center for Chair Caning » Newberry & Sons Chairs, now that’s what I call authentic…. Newberry & Sons Chairs, now that’s what I call authentic…. It ought to be firmly established by now that we are BIG fans of weaving seats with authentic bark here at Hobie’s Porch Chair Caning (Go Chair Repair!). This material is not mass-manufactured in China, it Paul Bunyan/Davy Crockett stuff that epitomizes life for most folks in the 19th century/pre-depression era of the 20th century. 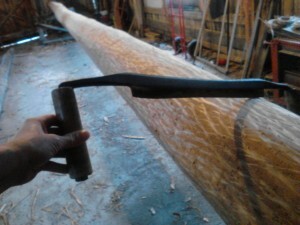 It is back breaking work that not many folks know how to do these days….nor would do, even if they could! It takes a special person to both see and extrapolate the potential of a chair from a tree. I’ve been fortunate to meet a handful of really impressive and diverse Chairmakers who I consider gurus. And now I am excited to tell you about my newest Chair Gurus and another lesson learned from the Tao of Chair. (see first blog post from 2009). I’ve been dealing with folks all over the world lately (Go Chair Repair! ), and certainly all over the US (thanks fantastic customers who find us online!). I have been sucked into social media marketing. I have been feeling guilty that my business is not all over you tube. So it was like slamming on breaks when you’re flying down a country road when I spoke on the phone with this wonderful family. “We’re in Macon County ’bout 15 miles from the Kentucky line” answered Louie when I asked where their shop was located. Talking with Mark’s Mom when I called back to coordinate, I realized they are doing this out of their house, from a shop out back. 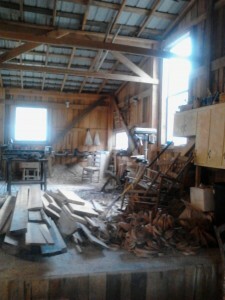 The chair shop was built by the Newberrys with the help of a grant. The shop is in cluster of buildings/homes/barns/shops, nestled in a cove in the Cumberland Gap in North Central Tennessee. Mark and his brother Terry are the 5th generation of Newberry Chairmakers in recorded history. And the Newberry family has been working hard, farming and making award winning chairs for hundreds of years. 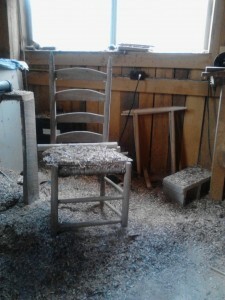 Their website states, “About the only time, the chair-making shop is closed is when there’s a crop that’s got to be harvested!” Hard work is something that is deeply ingrained in them, helping neighbors, farming the land, working another job to pay the bills so you can make chairs. Making your furniture instead of buying it. Making chairs….Lots of them. Out back in the shop. For generations. We drove on a rainy cold day right before Christmas, around curvy country roads, past shut down community centers and old country stores that had closed up shop decades before. It seemed most of the buildings could be haunted if you were an elementary school kid. It is rural as rural can get. Gorgeous hills, and a beautiful river, not much development at all, hard to see how folks make a living, definitely off the beaten path. Even after speaking to Mark, who required me to concentrate a little less on what was being said at the other end of the line, we still didn’t know what to expect and felt guilty for intruding so close to Christmas. The drive was muddy and a brown fluffy dog came running out to greet us. The buildings were numerous, and although there was a sign letting us know we had the right place, we were still unsure which door to knock on. And the dog was jumping up on me with muddy paws (good thing he was a cute dog). Louie told us to come on in, “they’re just finishing up for the day.” Inside the living room, decorated for Christmas, was a familiar scene…a large chair mostly woven, everything else pushed to the side, tools and weaving scraps on the floor. “Sometimes its too cold to work in the shop,” Mark said with a smile. We assured him our shop was also cold and our living room often taken over by chairs in progress. I wish I could quote all of the little particulars about our enjoyable shop talk with Mark and Louie, the photos do an okay job of showing off their shop, the wood burning stove, the piles of woodchips. The stripped tree with draw knives and other dangerous looking tools, some handmade, some purchased, mostly antiques. The ruint dog barking at the air coming out of the air compressor (he’s not the runt, he’s ruined/spoiled/ruint). The conversation eventually turned to having to work another job to do what you love. And just being authentic, making it happen, being proud of your work. We talked about our businesses and how much we charge (us: not enough, him: definitely not enough). Mark spoke of the how poor the area is, the vacant buildings, and how he charges a Tennessee price for neighbors. He bragged on their awards and articles and we did the same. He explained winter bark, and spring bark, and which side to use, what to use for warp vs. weft, and we came away with an armload of authentic bark. Help your handmade chairs that have been sitting in a barn for decades come back to life and be a stunning and functional piece of furniture. But what I got most from the experience (other than gorgeous locally sourced authentic hickory bark) was a feeling that I had met a couple of masters hiding in the form of your average guys from Tennessee. Dave and I left feeling proud of what we are doing with Hobie’s Porch (Go Chair Repair!). So what if you have to work at the post office or do catering gigs on the side while you figure out how to run a business! That said, Buy a Newberry & Sons Chair today! 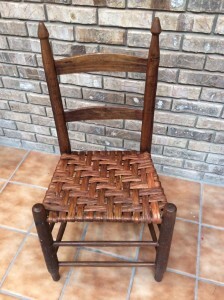 Or if you want to play with weaving a seat with authentic bark, buy it from Mark Newberry! Or we can fix your chair with bark from their shop. Anything with 4 rails can have authentic bark woven on the seat. It’s so much better than reed from China…. more authentic, strong, and true to nature. The look, strenth, and quality are worth the little bit of extra cost. Most importantly it’s worth supporting hard working and talented local craftsmen like Mark & Louie Newberry. Post Script: I’ve got to shout out to the good folks at Brian Boggs Chairmakers for their continued support of our business. They suggested I talk to Mark Newberry when I called them up to purchase (read: beg for) more coils of bark. I’m tellin’ y’all it is not easy to come by! BoggsBrian has decided to focus more on world class design and ergonomic but luxurious construction of chairs and less on the bark stripping mentioned in the last post. Look for them at the Architectural Digest Home Design Show in NYC March 20-23, booth M101 in the MADE section, which highlights some of the most talented artists and designers in the nation. They will still be using that gorgeous hickory bark (that they harvest and process sustainably) on their chairs, just not selling it. Robert Carran, who was so kind as to let me observe and distract him during processing (see last post), has taken over that portion of the business.